During instruction of the student, the school district teacher of the visually impaired quit. 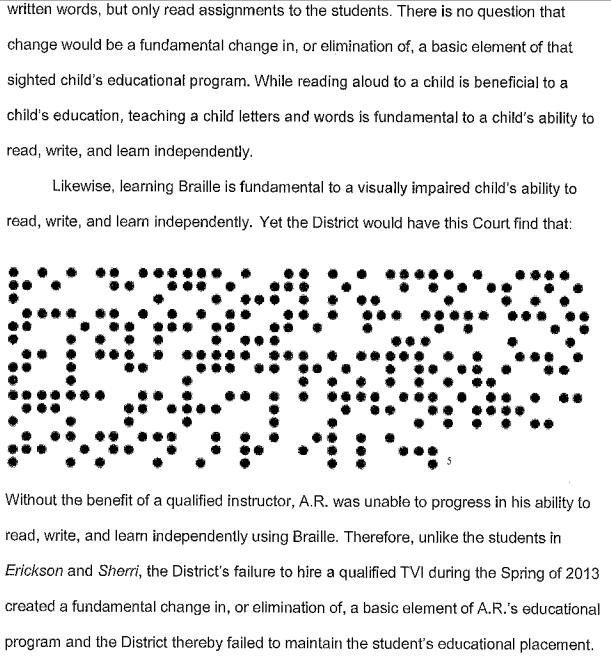 The district substituted with reading the materials to the student instead of finding someone to continue braille instruction. “…There is no question that change would be fundamental change in, or elimination of, a basic element of that sighted child’s educational program [to not teach letters or reading]. While reading aloud to a child is beneficial to a child’s education, teaching a child letters and words is fundamental to a child’s ability to read, write, and learn independently. I am going to that same situation with my daughter who just started kindergarten. Please email me. I want to know more about this case. We are also in Las Vegas.